With education costs rising and choices sometimes limited by location, students are increasingly looking for online resources to satisfy their requirements starting as early as high school. The benefits of taking classes online are often great: no more 7:30 a.m. classes, no need to pack a lunch or show up with lunch money, and considerable freedom in tailoring the learning process to your own needs. What most students don’t realize is just how much of a responsibility online classes can be. 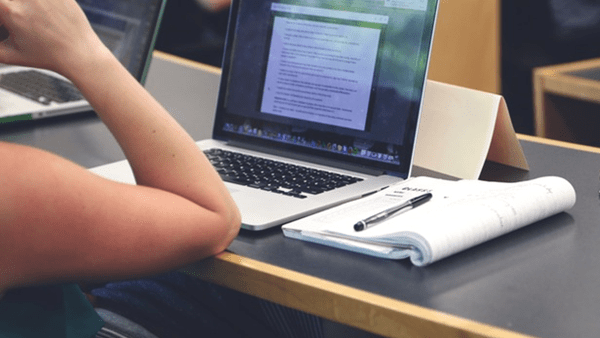 In the majority of cases, online classes require the student to be entirely self-motivated, even if the class has an online proctor giving lectures. Attendance requirements tend to be much less stringent than in-person classes, and learning focuses much more heavily on completing ungraded assignments. If you’re planning to attend online classes or have already started, there are a few things that can help you succeed. Anyone that’s ever been successful in an online class will tell you the same thing about having a workspace. It isn’t just about having room to do your work. Your brain recognizes patterns, and when it associates one area with learning, you’ll be primed for the activity as soon as you go there. It’s the same phenomena we experience when performing our nighttime rituals and ultimately feeling tired as soon as we get to bed. Besides that, most of us need the right type of environment to study. Most do well with a quiet, well-lit environment free of distractions, such as television and family. It might also do well to separate yourself from personal devices. Using a separate browser free of background noise and social media can also be helpful in keeping you from being distracted. Naturally, every online class is going to have certain technology requirements. It may be that you’ll need a PC, or you may be able to access the entire class on a tablet. Some programs require iPads because they use tailored software to test students in an effort to provide a controlled environment. A printer is rarely a poor investment. You’ll also want to make sure those devices don’t break down on you at a critical moment. Insurance might cover physical damages, but it does nothing for your data. Using security software such as a Virtual Private Network (VPN) and an anti-malware suite can help keep your devices from becoming compromised. It can be tempting to avoid paid services such as VPNs, but ultimately you’ll be getting a much better experience with fewer interruptions and concerns. If you’re unfamiliar with VPNs, I suggest reading this guide by Secure Thoughts to illuminate the topic further. Another service you might consider is a backup program. While tablets and smartphones frequently offer different services for basic items such as contacts and messages, most default backup systems don’t consider your important school data (papers, notes, etc.) Investing in a backup can save you from a disaster, such as failed electronics. Using cloud storage is also an option, particularly for text files. You’ll encounter a number of ways to take notes, from taking notes by hand to typing them on a word processor. One of my personal favorites is an Apple exclusive, best utilized on the iPad using the Apple Pencil. GoodNotes is a truly excellent app because it allows you all the convenience of handwritten notes but with all the awesome benefits of being digital. You can create multiple note packets and even search for handwritten text as though it were typeset. Beyond fancy gadgets and software, you’ll find an increasing need to budget your time effectively. Some online classes aren’t very demanding—they may only have a midterm and final exam for your entire grade. Those that don’t require attendance or don’t provide regular quizzes are the riskiest because there is little way to gauge your progress. Get ahead of the game early by reading the syllabus and class schedule closely. Assign yourself hours to clear class content such as readings, papers and homework. A few weeks into the class, do a review of your schedule to see how it’s working out relative to the workload you’re expected to complete and adjust your time accordingly. Most of all, don’t forget to leave time for studying. Even if you’ve been keeping up well, you’ll want to give yourself extra time to prepare for your big tests. Most students, social or not, are very tempted to take a class all by themselves. First timers can easily fall for this trap because they’re so used to taking classes as a large group that their first online class can seem liberating. Forming relationships with other students can help fill in gaps with your study. Questions you didn’t think to ask might come up when another student studies or collaborates with you in a group. You might also gain lasting contacts that will help you in future classes or even in your career when you finally finish school. Virtually all online classes offer you valuable resources; they may come in the form of additional readings, private access to videos and audiobooks or contacts to professors and other educators. If you’re ever uncertain about something in your class, make contact with the class proctor to find out what he or she can do to assist you. Some professors will offer practice quizzes or other study tools to make their classes easier. Don’t discount these; even professional graduate level schools make use of such tools, and they’re training doctoral candidates! Just be sure not to replace your own notes and study habits entirely, as prior success using one method is a good measure for future success. In this case, I mean the statement literally: it is very easy to use tricks and outside help to pass online examinations without actually knowing the material. Looking up answers for an online quiz might help earn you a higher score, but you won’t learn the material as effectively, and when the real exam comes, you’ll wish you’d studied harder for the quizzes. That being said, make sure your class offers a way to review your tests. If you’re not able to see what mistakes you made or view the correct answers, there’s no way to be certain what you do and don’t know. No matter what challenges come your way, don’t be discouraged. Online classes are a mixed bag, and some will be considerably harder than others. Like anything, practice and dedication ultimately lead to better results. You can do it if you try; all the resources are there, you just need to do your part. Have more questions about taking classes online? Feel free to leave them in the comments for us to respond. About the Author: Cassie is a big proponent of technology and how it can be used to better our lives. Education is one area that can benefit tremendously, both from new tools to learn and increased opportunity for students. She hopes her advice will help make things easier and safer for her readers.